The first group of Global Immersion Guarantee students have just returned from India! The Global Immersion Guarantee (GIG) is a two-week overseas study trip that encourages students to consider their unique place in the world by tackling major global issues such as urban development and environmental sustainability. We caught up with students to find out what happened on the inaugural trip and why the experience is so valuable. Bachelor of Global Studies and Science student Annabelle Reiger is still buzzing with excitement about the experiences and insights she gained on the India trip. 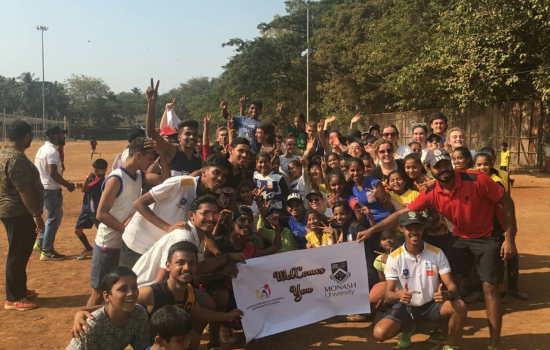 For her, the defining moment was when the Monash students visited a local sports clinic in Mumbai. Picture the scene: A balmy afternoon, a flurry of activity on an expansive dusty field, a crowd ranging in age from six to 21, some decked out in the colours of their favourite team (white and blue, and yellow and black by far the most common) chasing balls – but not the type you’d expect in India – Australian Rules Footballs. Annabelle remembers throwing a ball to some particularly eager girls, laughing as they communicated with each other through the language of sport. She says there was very little verbal communication, given each group was hardly fluent in each other’s language. “It really blew me away. It was a lot of showing instead of telling – we were even able to use a lot of universal things like pointing and using your arms to say line up, ”says Annabelle. Annabelle and her fellow students were also exposed to fieldwork and group projects around Non-Government Organisations (NGOs), and were encouraged to think about how the government handles particular items relating to international negotiations and also in human rights. Now back home, ready to embark on her second year of studies, Annabelle says the India study tour has given her a clearer idea about her career direction. Reflecting back on a visit to a tribal community and the issues that villagers faced, she saw parallels between their struggles and those who live in remote indigenous communities, and feels inspired to generate new positive outcomes. For Bachelor of Arts student Matthew Braida, things really started to make sense once the classroom theory was reflected in the real world. The GIG program in India includes both lectures at the TATA Institute of Social Sciences (TISS) and learning in the field, seeing the work NGOs, businesses and other stakeholders conduct to make a difference in Mumbai. Matthew points to lectures focussing on the concerns developers have when building new architecture to coexist among the already-existing apartment buildings and shopfronts. “They (TISS lecturers) showed us a photo of this apartment building and they said it took up a certain percentage of Mumbai’s electricity bill each month, and it was apparently the biggest building that consumed electricity,” he said. 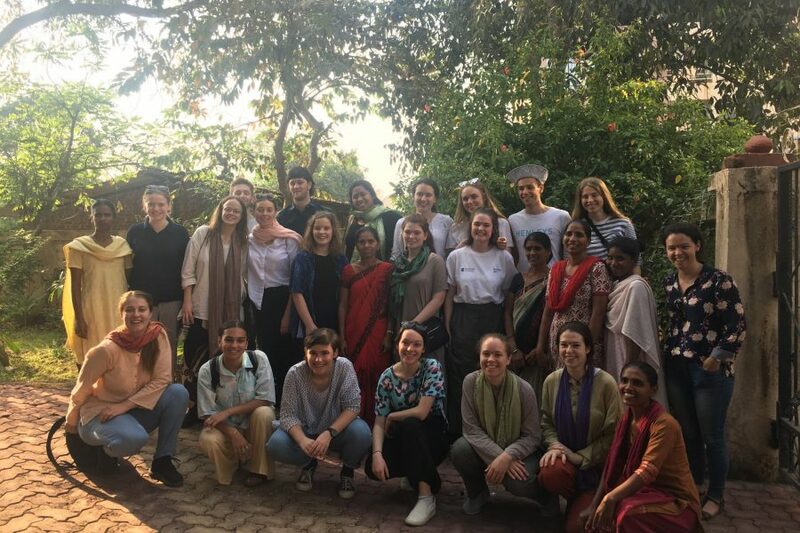 The GIG student cohort also embarked on a trip outside of Mumbai to witness the work of an NGO run by a Christian sisterhood called the Prema Charitable Trust. “Walking through the village, it was amazing to see everything that we talked about was actually put into a frame of reference,” he said. So with these new concepts in mind, how does Matt hope he can incorporate them into the rest of his degree and inform his career? He says seeing the work of not-for-profits and their fundamental desire to work for the benefit of others to generate tangible outcomes has inspired him to make a difference by pursuing a career in teaching. The class system in Mumbai and its impact upon instigating meaningful change in a developing city was something that fascinated Bachelor of Arts/Engineering student Kate Dunwoody. “There’s a lot of new development but also a lot of rundown buildings, and heaps of construction – but there’s always big differences because there was a big divide in the inequality between earnings of money,” she said. Kate believes her time in Mumbai helped immensely with understanding not only how to come up with ideas around sustainable solutions for our constantly growing society, but how to do so under adversity, when there’s potential pushback from a community’s residents. And she says she finds solace in knowing that sometimes, the simplest method to approach positive change is by starting at the grassroots level, tackling major global issues on a small scale to commence a tidal wave of action. “A major part of that was about community engagement and consultation, so finding out from the people what exactly was needed and if they had a connection to a solution. For these three students, just a small sample size of the engaged group who travelled abroad to better conceptualise their roles as global citizens, they feel further inspired to create meaningful change, and utilise the knowledge obtained within their Monash Arts studies to help others. The Monash Arts Global Immersion Guarantee (GIG) is a unique overseas study program for all first year Bachelor of Arts, Bachelor of Global Studies (and related double degree students) which includes a funded overseas experience. Your journey starts here with Monash Change of Preference.